Counseling and Testing Services (CTS) and the Student Health and Wellness Center invite all students to participate in the 4th annual Healing Art Showcase. This Showcase exhibits artwork created by University of North Texas (UNT) students. It is designed to help students empower themselves as well as other students. The goals of the Healing Art Showcase are to educate about and address mental health issues that can impact academic and personal functioning among students, as well as decrease mental health stigma. We invite you to submit artwork that represents empowerment and resilience related to mental health. The Healing Art Showcase will be held on Thursday, November 8th, from 6-7:30pm, at Chestnut Hall. This exhibit will be open to the public. Refreshments will be served. According to the National College Health Assessment (2018) data, the top five factors that impact college students’ academic performance are stress, anxiety, sleep difficulties, depression, and work. If you choose, your artwork may focus on one of these areas. Awards will include gift cards and other items (e.g., UNT clothing) from businesses in the Denton area. Awards will be confirmed by the deadline for entry (October 19th). 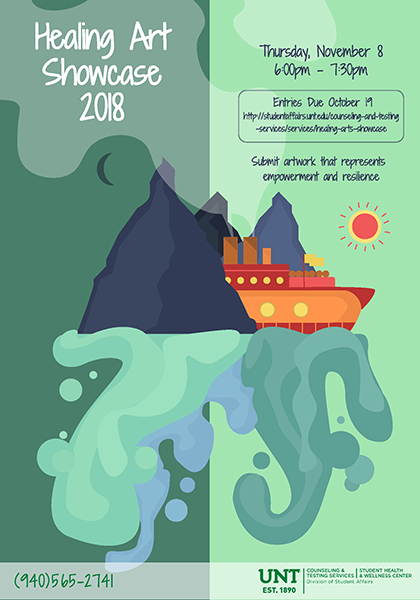 Entry Deadline is Friday, October 19th, 2018.